Today is the last day with bad weather, the weather experts say. Oh well, we did indeed have some rainy days, often in the afternoon a lot of wind and we had to wear a thin sweater a few nights when we were outside in the evening. But all in all it is not that bad. And this morning the sun shines when we set off again towards the east. First we see beautiful clouds in the sky in which we see all kinds of animal figures when we drive north. But as soon as we enter the highway to the east it becomes very dark and it starts to rain. When we reach Kavala after about 200 kilometers, the sky happily brightens up again and the clouds become lighter again. The temperature is also rising and when we arrive in Keramoti, from where the ferry goes to Thassos, it feels like summer again. We do not have to wait that long until we can get on the boat. Because it is not yet high season, we have not booked and fortunately that was not necessary. It is a crossing of 35 minutes and soon we see the island getting bigger. Last week we have often seen the island from the coast and were increasingly fascinated by it. We had never heard of it and it looked pretty big and mountainous which we always find beautiful. Because the weather was not so good then, we have postponed our visit but the coming week is going to be better, so a good time to spend on an island. After just more than half an hour we approach the port of Thassos. It is also the capital of the island and is officially called Limenas Thassou (port of Thassos). The island rivals with Corfu to be the greenest island in Greece and it indeed looks very green with lots of forests on the steep slopes. The ring road around the island is about 105 kilometers and our first apartment is about 12 km from Thassos on the east side. It is known for its beautiful beaches, but the Golden Beach, where we are right next to, is obviously busy. We are warmly welcomed at the apartment complex in Skala Portemias. To be honest, we are always warmly received, we do not know the Greeks any differently, even if they do not speak a word of English. This time we are not the only guests and that makes it a bit more relaxed, now we are not the only ones the family has to pay attention to. We also have a super deluxe room, very spacious with a large balcony. We take a long walk through the village that is stretched along the beach and it is quite touristy here. Then we are glad we have a car at our disposal, we are not bound to where we are staying. Tomorrow we will set out to discover some more of the island. We have initially booked for 4 nights but after everything we have read about the island and what we have seen so far, it is possible that we will stay a little longer. But now we want some food first and here it is the same as in so many places in Greece: they have those hard chairs with a straight back that my back can not stand. And in places with better seats you can only order drinks. The pizzeria is the only exception so we are forced to eat pizza tonight. A radiant sun wakes us up and we quickly set off towards the south of the island. At each sign to a beach that we encounter, we drive down the mostly bad roads and although the beaches on the east coast of Thassos would be the most beautiful, there are very few of them. At a hotel under construction we see a sign that refers to an archaeological site but when we are below we see only large prohibited to enter signs. Gosh, we have seen that here before. But now we have to go up the hill again but the sand is so sandy that we almost get stuck with our rental car. Most beaches that we encounter afterwards are small and often busy or occupied by beach chairs from the hotels that are located there. At Paradise Beach it is busy but we still find a very nice spot, a kind of private beach, where we spend a few hours. It is a real sandy beach and the water is wonderfully warm. It is a only a small piece between the rocks and apparently the flood is rising because we have to move further and further up the beach. It is time to move on again when we are almost sitting on the rocks, we have sat and bathed in the sun long enough. Thassos is a circular island with many small bays but no protuding peninsulas as you can see in many other islands. It is a mountainous island and the highest point is slightly east of the middle and is more than 1,200 meters high. There is a well passable ring road over the island that mainly connects the villages along the coast. Many villages have the word Skala in the name, that means stairs. All these villages have a staircase to a homonymous village in the interior. So we stay in Skala Potamias and more inland (and also higher up) lies the village of Potamia. Where there are no villages, there are pine trees, the island is covered with them. Even the bare rocks seem overgrown with it. Then we drive a bit further to the south, to Aliki where there is an old settlement but the road is closed. The Phoenicians have colonized Thassos around 650 BC., probably attracted by the gold found here. Later, Greeks of the island of Paros founded a colony here. Except for the gold, Thassos was also famous for its good wines in ancient times. We continue to the nunnery dedicated to the archangel Michael that stands on top of the rocks above the coast. It is a big complex but we are not allowed to photograph inside. Although Thassos is not known as a very tourist island, tourism is nowadays the biggest source of income and we notice that many hotel complexes are under construction. They will probabaly all take pieces of beach and make them private. In the interior almonds, walnuts, olives are grown and honey is also an important product. On the left picture is the house sign of farmer Tyrla, but many farmers nowadays combine their business with selling products to tourists. As far as nature is concerned, Thassos is in any case a beautiful island and we have seen many beautiful rocky coasts today. Our apartment complex, Sea Green, also has a restaurant and we have someting to eat there at night. We have seen and done so much this holiday that we decide we are not going to try to see everything on this island but have some more rest. After all, we also have to save something for a next visit. I have enough books on my e-reader and Teije has a number of 'real' books to go. We get up late and walk into the village for a full breakfast: fried eggs with bacon, coffee and orange juice by the sea, a nice way to start the day. For dessert we both get an ice cream, which is something new. We had not experienced before that we also get a surprise after breakfast. Fortunately, it is not baklava or ouzo! It is already pleasantly warm and after breakfast we first find a beach nearby where we spend a few hours reading. Today we go inland, first to Theologos where we see a few circular buildings at Asvestokamino. It is unclear how old they are but here they used to make lime to build houses. Theologos itself is one of the oldest villages on the island and the narrow streets are surrounded by many 19th century mansions. There are all kinds of shops where local products are sold and we buy a jar of honey. Then we walk over the cemetery which is very appropriately named Ilysia, Greek for the Elysian fields, a kind of ancient Greek heaven. A sign points to Kastro, a castle, but the path to it is so bad that we turn around and continue westwards until we reach Potos on the coast. This is a fairly large tourist place and we make a stop to have a good look at the map. On this side of the island there is still a lot to see and we are not sure if we can stay in our current apartment, so via internet we look for a place for coming Saturday and the rest of next week and we book a room, that saves us some travel time. It does mean that all those things that we still wanted to see on the mainland of Macedonia have to wait for another visit; In the coming months we will be very busy, so we will relax the rest of the holiday. We start immediately with that, by staying for another half an hour on a beach in the neighborhood of Potos. On the way back we pass the southern spirit and we regularly come across small open cars, no idea how they are called. On a straight stretch, and there are not many of these on this road, we encounter such a cart, swinging from side to side. It is going in increasingly wide bends over the road and Teije can hardly prevent a collision. That goes wrong, and in the rear-view mirror he sees the car indeed going upside down. We quickly return the car to provide assistance but except for some severe abrasions and a terrible shock the 3 passengers seem unharmed. They had a lot of luck that the metal cagewire protected them because they did not wear belts. Soon the cart is put on its wheels again and a whole crowd is gathering around them. When we have convinced ourselves that the passengers are in order we continue, but I am a bit frightful now. A little further on we see a similar type of car halfway across the road and parked in a bend: Mom, Dad and 2 children are standing at the other side of the road against the crash barrier to take pictures. Yes, a beautiful view, but they should know how dangerous it can be on these winding mountain roads where no one obeys the speed limit. 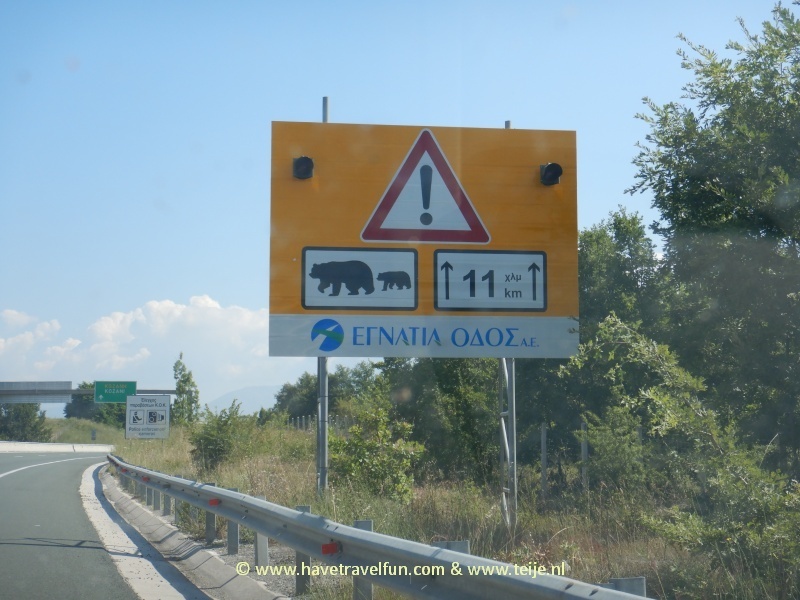 After a whole day of doing nothing we drive north and pass through Limenas, the port city of Thasos where we also arrived. But I find it very confusing, you may call the city Thassos or Limenas or Limenas Thassou, all 3 are used. In ancient times the city was slightly to the east and there are several ruins to visit. For the archaeological museum we are just too late, therefore we follow the signs to the sanctuary of Herakles where there is not much to see. And then the Gates of Zeus and Hera where there is still a pillar standing but is also not very spectacular. We would also like to see the amphitheater but for that you have to climb a lot. After a few hundred meters we give up already. Although it is already after 4 o'clock, it is still 33 degrees, and that is just too hot for such a climb, maybe another day. We stroll through the village itself and along the boulevard and look for a restaurant with lots of shade. I normally never drink so much, but in Greece, with such temperatures, I am very thirsty all the time and the orange juice tastes great. The only drawback is that it is so expensive, often € 3 or more, we have even paid 5 euros once. And then they often throw in a lot of ice cubes which I then have to take out again, so that the taste is not diluted. The food is relatively cheap and here too we get a plate full of food for 6 euros.